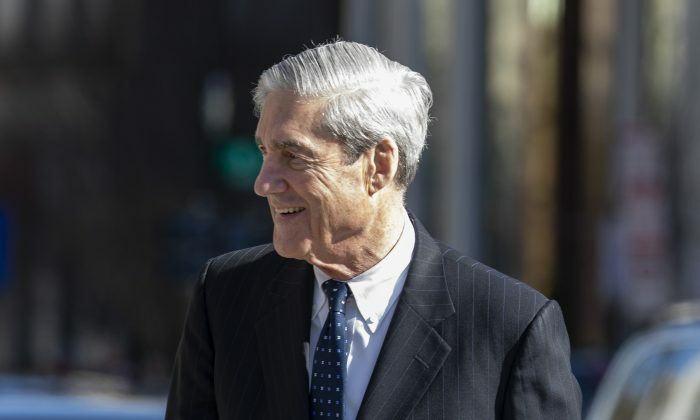 The final report by special counsel Robert Mueller has completely exonerated President Donald Trump, and those connected to his campaign, of all allegations of colluding with Russia, according to a summary of investigative findings issued by Attorney General William Barr on March 24. Barr also concluded that the special counsel didn’t provide enough evidence to substantiate that the president obstructed justice. “The investigation did not establish that members of the Trump campaign conspired or coordinated with the Russian government in its election interference activities,” Mueller’s report states. Barr submitted the four-page summary (pdf) to the chairmen and ranking members of the House and Senate judiciary committees. The letter notes that the special counsel interviewed approximately 500 witnesses, executed almost 500 search warrants, issued more 2,800 subpoenas, obtained more than 230 orders for communications records, and issued nearly 50 pen orders. Mueller employed a staff of 19 lawyers and 40 FBI agents, analysts, forensic accountants, and professional staff, according to Barr. Mueller referred several cases to other offices, but will not issue any more indictments, Barr wrote. “It was a complete and total exoneration,” Trump said. “It’s a shame that our country had to go through this. To be honest it’s a shame that your president had to go through this. Mueller outlined two distinct efforts by Russia to interfere in the 2016 presidential election. The first effort was run by the Internet Research Agency, a Russian organization that spread disinformation in order to sow discord in the United States. The second effort consisted of hacking operations that successfully stole emails from the Clinton campaign and the Democratic Party. In both cases, Mueller found that neither Trump nor anyone associated with his campaign conspired or coordinated with Moscow despite multiple offers from people affiliated with Russia. Mueller effectively delegated the exoneration decision to Barr, who concluded that the evidence in the special counsel report is not sufficient to establish that the president committed any crime. Barr made the decision in conjunction with Deputy Attorney General Rod Rosenstein, who oversaw the bulk of Mueller’s special counsel tenure. The attorney general said he made the decision after consulting with Justice Department officials and the Office of Legal Counsel. Barr noted that the decision to exonerate the president was not affected by the constitutional question of whether a sitting president could be indicted. “Generally speaking, to obtain and sustain an obstruction conviction, the government would need to prove beyond a reasonable doubt that a person, acting with corrupt intent, engaged in obstructive conduct with a sufficient nexus to a pending or contemplated proceeding,” Barr wrote. The manager of Trump’s 2020 reelection campaign, Brad Parscale, issued a scathing rebuke of the Democrats, who sustained the narrative that the president was guilty of colluding with Russia and obstructing justice. Rep. Jerrold Nadler (D-N.Y.), chairman of the House Judiciary Committee, said it “seems like the DOJ is putting matters squarely in Congress’ court.” Nadler started a House investigation of Trump and his family, associates, and companies earlier this month. Trump has always denied collaborating with Moscow or obstructing justice. Russia says it did not interfere in the election, although U.S. intelligence agencies concluded that it did. The DOJ announced on March 22 that Mueller had ended his investigation after bringing charges against 34 people, including Russian agents and former key allies of Trump, such as former Trump campaign chairman Paul Manafort, former national security adviser Mike Flynn, and Trump’s former personal lawyer Michael Cohen. None of those charges, however, directly related to whether Trump’s campaign worked with Moscow. Mueller’s conclusion matches of the House and Senate intelligence committees, both of which have concluded after similarly intensive investigations, that there is no evidence of collusion between the Trump campaign and Russia. “No Collusion, No Obstruction, Complete and Total EXONERATION. KEEP AMERICA GREAT!” Trump wrote in his first Twitter message since the release of the summary findings.